NEWSFLASH —Mosgiel pool, tracking [PONT] . . . .
Taieri Community Facilities Trust project manager Shaun Pont called on councillors to allocate $750,000 to the design phase of the new facility for the next financial year. 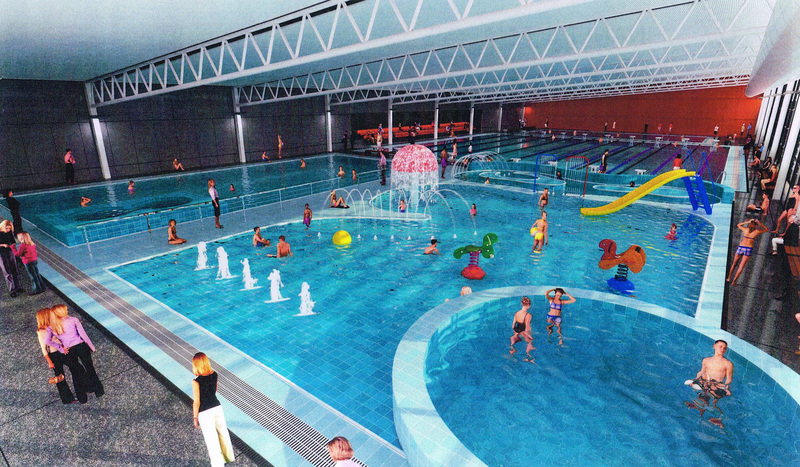 Mosgiel residents made an impassioned call for Dunedin City councillors to give a multimillion-dollar aquatic facility the “green light” sooner rather than later. In recognition of the level of interest in a $15 million four-pool aquatic facility the council held part of yesterday’s long-term plan hearings at Mosgiel’s Salvation Army Hall. By December  we will have completed a thorough feasibility study, ready for presentation to Council. The feasibility study for a new aquatic complex on the Taieri is now complete and has been lodged with Council. There has been an amazing amount of work done in a short amount of time, and we want to acknowledge the stellar effort by Shaun Pont of the Logic Group. In presenting this report, the Taieri Community Facilities Trust (Trust) is conscious of the Dunedin City Council’s twin objectives of city growth and strong fiscal management. It recognises that growth is both economic and social, and that the two are correlated. If Dunedin is to grow then it needs investment both in economic development and in facilities that enhance the city’s quality of life. A city is defined by its people. So as a city, if we are to grow and prosper then the community must stand beside Council. Only by working together can we both grow as a city and reach the Council goals for financial stewardship. Community-based organisations are key to solving some of the most difficult neighbourhood issues. It is therefore important from the outset to understand that a swimming pool is not just about a place but about our people. Pools help to bind communities together and meet the challenges of building social inclusion within a community. They help to address the health issues within a community as we endeavour to meet national obesity and activity targets. A swimming pool is more than just somewhere to swim. It is a meeting place and heart for the community and a conduit for many activities. The full report is available for download here: Taieri Aquatic Facility Report.pdf. The funding capability report is available here: Compton Report. For design we have engaged the Logic Group, who are working in partnership with award-winning architects Baker Garden and quantity surveyors Flanders Marlow. Who is the Logic Group? We provide specialist property advice and development management leadership. Updated post Mon, 4 May 2015 at 5:39 p.m.
█ This afternoon an anonymous caller told What if? Dunedin that people asked to speak at the Pool meeting (initially scheduled for a different time and venue), and who were unable to attend then, have not been emailed with the new meeting information below. They haven’t been asked to re-visit their options…. DCC/Mayor Cull should clear up whether they will be re-invited to speak. 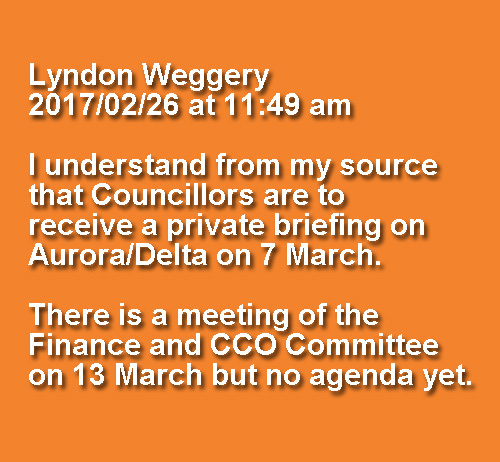 On the strength of public submissions received, the DCC will hold a meeting at Mosgiel that prevents many Dunedin ratepayers and residents from attending. This is how DEMOCRACY works, DCC-style at Dunedin. The email below was sent to those who are registered submitters ONLY on the city council’s Draft Long Term Plan (draft LTP) item, ‘Unfunded Mosgiel Aquatic Facilities’. A second email from DCC explained that the first had been sent to me in error. Elizabeth Kerr, exercising some independence, specifically did not submit on the POOL RORT that is being perpetuated against the Ratepayers and Residents of Dunedin and which multimillion-dollar project appears to be supported by Mayor Liability Cull as a political ticket for himself. Sent: ‎Monday‎, ‎4‎ ‎May‎ ‎2015 ‎2‎:‎36‎ ‎p.m. Thank you for your submission to the Dunedin City Council Long Term Plan 2015/16 – 2024/25 on the Unfunded Mosgiel Aquatic Facilities section. In your submission you indicated that you wished to speak to the topic. Due to the number of submissions received on the proposed Aquatic Facility, it has been decided to set aside a session for Councillors to hear the submissions on this subject only. Salvation Army Hall, 4 Lanark Street, Mosgiel. The meeting will be opened with representatives from the Taieri Community Facilities Trust presenting their submission first. This will be followed by other submitters speaking to their submissions on the proposed Aquatic Centre. or myself on 477-4000 or by replying to this email and we will schedule you with another speaking time. Please note that if you have submitted on many items, we will send you a separate speaking time to speak to the other items on your submission. Submitted on 2015/05/04 at 12:08 pm | In reply to Mick. Calvin. When you place your bets on the pool, make sure you only back for a place. After reading the ODT article on submissions, it would appear that the trust has been as deceitful as ever. Remember they claimed that they had over 2000 supporters to their online survey. Well when the push comes to shove, it would appear that only 1030 have made submissions to the LTP, and that includes those apposed to the pool. What has happened to the other 1000+ that they claimed to have the support for the pool. Just like the $7.5 million they claim that the Mosgiel community are supposed to be fronting up with. In both cases, the pool support and the community money they claim, does not stack up. Because they are unable to back up their claims. Just cheap talk and deceitful, a copy of the stadium debacle all over again. NOW CALL GOES OUT TO DUNEDIN RATEPAYERS…. 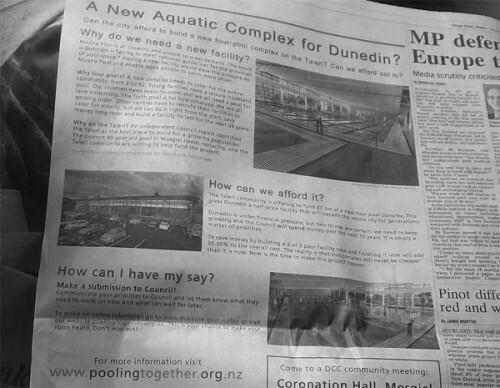 Dunedin City Council estimates the pool will cost $18.2 million, with an ongoing yearly shortfall of $2.3 million to run a four-pool complex. The Taieri Communities Facilities Trust hopes the wider Dunedin community will support its push for a new aquatics centre in Mosgiel. The trust hopes Dunedin residents will join with the Taieri and make submissions in favour of the $15 million pool during consultation on the Dunedin City Council’s draft long-term plan. The project is included for consultation as an unfunded item. Stadium: Who is being protected? What is an advertisement, and what content of an advertisement needs to be able to be verified? Readers of the Otago Daily Times, and followers of the on-going stadium debate which shows no signs of lessening in its intensity may be intrigued to know just where the sensitivities of the ODT lie. Let us look at some simple facts which cannot be in dispute. 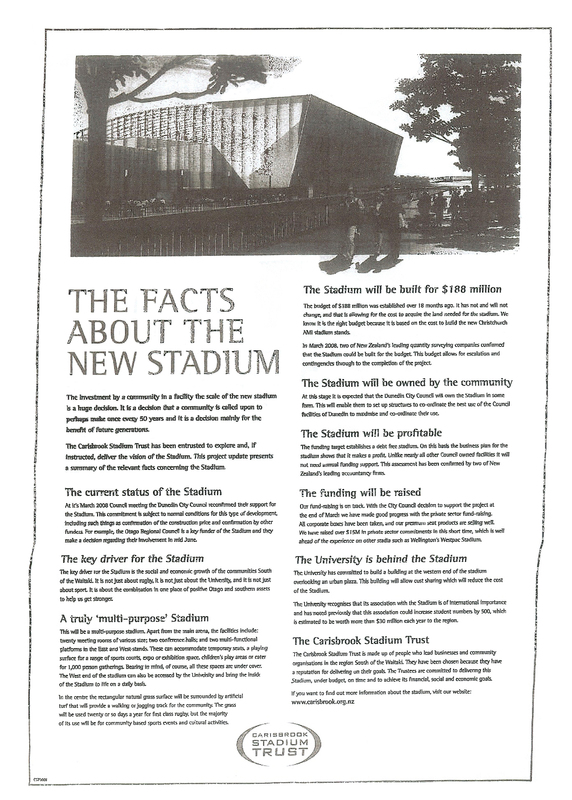 The Carisbrook Stadium Trust which was acting as an agent of the Dunedin City Council, decided to publish a full page advertisement in the 31 May 2008 issue of the ODT. The advertisement was headed up “The Facts about the New Stadium”. In this advertisement it was claimed that “The funding target establishes a debt free stadium. On this basis the business plan for the stadium shows that it makes a profit. Unlike nearly all other Council owned facilities it will not need annual funding support. This assessment has been confirmed by two of New Zealand’s leading accountancy firms”. This is published and accessible and the wording of the advertisement cannot be interpreted in any other way as the heading refers to all that followed as “facts”. The advertisement also claimed that the Trustees of the CST were “committed to delivering this stadium, under budget, on time and to achieve its financial, social and economic goals”. Now of course some advertisements for wrinkle cream use all sorts of phrases like “clinical tests prove etc etc”. Many people are ready to pounce on claims that are unable to be substantiated, or are untruthful, or are misleading, or cannot be proven. In other words, the makers of the wrinkle cream need to be able to show that there were indeed “clinical tests”. The fact that the clinic may have been part of the company making the cream is sometimes understood, and in any case, the makers of the cream hardly ever claim that “totally independent clinical trials using double blind processes found what we are claiming is true”. But this is not some pot of wrinkle cream. The CST claimed a number of facts in their advertisement that they said were verified by two of New Zealand’s leading accountancy firms. In light of the continuing operating losses of the Awatea Street Rugby Stadium, and the on-going debt costs from its construction, it would be interesting to be informed of just who the two leading NZ accountancy firms were that confirmed the Carisbrook Stadium Trust’s claims published in the ODT in 2008 that the stadium would be built debt free and would return an annual operating profit. Maybe these two companies could now tell us how the reality differs so much from the published claims. The ODT has informed me that my letter was noted but not selected for publication. This is newspaper speak for it’s been binned. Should the ODT not be interested in ensuring that an advertisement of a major size on a subject that had divided the City was not at all misleading in the same way that claims were made that may not be able to be substantiated, or could be shown to be unfactual? Is the ODT particularly sensitive to the views of those that decided to publish this advertisement? Had the ODT entered into any understanding or arrangement that the paper would support the stadium project which may have led to less than stringent standards of advertising being followed in this case? But perhaps more telling is that to my knowledge, the ODT has not followed up on the obvious story of just who these two leading NZ accounting firms were that supported the claims of a debt free stadium and an annual operating profit. My point is that time and distance show us that these claims were so at odds with the claims made and published, that serious questions remain unanswered on just how the CST and these two companies got it so wrong. Maybe another newspaper sees the story that the ODT doesn’t?